The Hexagrams - see also "List of Hexagrams"
The Creative works sublime success, furthering through perseverance. (Wilhelm). As your studies of the Yi progress you will find that various translations of the text resonate more with you than others. This is true in the Chinese as well. There are times when it is useful to know the underlying ancient meanings of the text. ‘Do not use. For an expedition, appoint officers’. ‘Do not use for an expedition. Appoint officers’. Thus the division of the phrase changes the meaning significantly. When faced with a decision this is a key difference. A task need to be accomplished. Do we proceed now? In the first variant, yes, but delegate the task to a trusted subordinate. In the second, do not undertake the expedition at this time, appoint delegates. The conventional interpretation of lines by their centrality, correctness and correspondence do not always apply, but in Zhun1 we have a classic instance of how this thinking developed. The lines at each Yin position of the gua contain the phrase ‘horse and wagon part’, or as some translate it ‘the yoked horses pull in different directions’ or ‘horses in retreat’. This means working at cross purposes, working at odds with one another. There is an old joke about ants rolling a ball of dung up a hill. A thousand ants get below it, two thousand above it, and all push. Naturally the ball of dung ends up rolling down the hill. Both situations describe helplessness and frustration. Charging off into the woods without a guide and getting lost. Unable to move forward, the horses part or turn back on their own. Look at how they correspond. The third line is a Yin in a Yang position, is surrounded by Yin lines, and its corresponding line at 6 is also Yin. So it has no resources of its own, no guidance, and it is not in a position to assist itself, let alone others. It is indeed in the midst of the forest without a forester. The sixth line has gone through all of this difficult hexagram and is now at its periphery, and there is no corresponding Yang line in the third place to support it. ‘A great stone’ or ‘A slab of stone’, are two possible translations of the first phrase of the line. I see two separate concepts here. First, as a plant sprouts underground it encounters a stone blocking its way to the sunlight. It has to adapt, to grow around the obstacle, or seek the assistance of others to help it do so. The next phrase means ‘A good omen for choosing a residence’. So that same slab of stone that was a dangerous obstacle coming from below is a fine foundation slab on which to build a residence, once again delegating helpers, as in the judgment text, to assist in the many tasks involved. An old man, but not a wise one, went out into the field where the sprouting plants were just starting to show through the ground. He decided he wanted to ‘help them grow’. So he went up and down the rows pulling each one up several inches. Exhausted, he went back home to tell his son of his great idea. The son rushed out to the field, finding the whole crop dead and withering in the field. All the people of Song laughed at his example and it is a tale told to this day. Here we have passed by the initial difficulties of line one…and encounter others. The image, as in the fourth and sixth lines, is the horses not moving. In this instance one of the translators of the Yi (Stephen Field), associates the line with the old folk tradition of abducting the bride. This was done in China as well as the Caucasus and other places in the world. The groom’s friends would disguise themselves as bandits and descend on the bride’s carriage, carrying her off to her husband’s house. Thus the phrase ‘They are not bandits, but come to wed her. I have always been curious about the term ’10 years’. She is not pregnant, but in ten years she will have a child. It seems a long time, and makes me wonder if it isn’t something of symbolic meaning as a number. Zhou Yi Dao is all about decision points, as is the Yi which is its foundation. So in line three the noble is faced with what do when they lack expert assistance. The example is someone chasing a deer. It runs into the deep part of the woods, a dangerous place even now, in the days when those woods were still the hunting grounds of tigers…even more so. So a noble would be guided by a forester. A local who knew the place well and no doubt was expert at avoiding the perils of the forest. A wise person does not ‘rush in where fools fear to tread’. The final phrase is an omen: ‘Going is ominous’. The fourth line is a Yin, and in a Yin place. It has a correspondence with the first line, a Yang which in this case represents the bride’s parental home. It is close to the fifth line, also a Yang, which represents the groom. Thus this line is a happy omen for marriages and, even though repeating the phrase about ‘horses turned about’, carries an omen tag of ‘Good fortune’. This is an important lesson on the lines. Even though the first line can be viewed as foreboding, and the fifth is only fortunate in small matters, the fourth, making use of the strength of those lines, is fortunate. Each position has characteristics of its own as an individual and also fits into the general scheme of the hexagram as a whole. The third word of this line is interesting. The term Gao1膏, originally meant fat, fatty meat. It may have originally been from an early layer of the Zhou Yi that spoke of the meat used in ritual sacrifices. 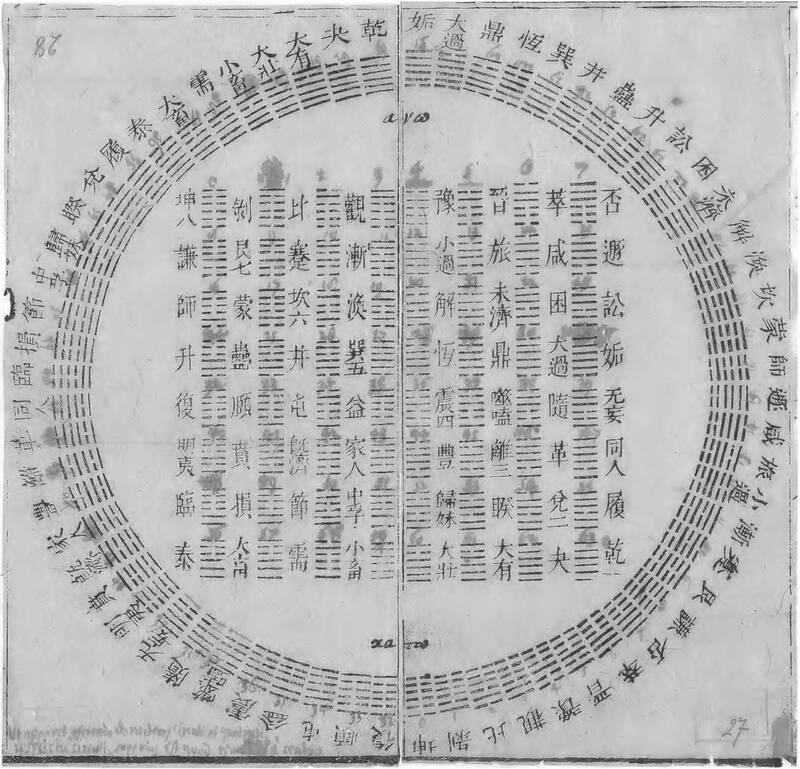 Edward Shaughnessy, translator of the Mawangdui Yi Jing on Silk, a Han dynasty copy of the Yi Jing found in a tomb, translates Zhun1 as ‘Hoarding’. Thus this line is ‘Hoarding its fat’. The curious thing is that with such a good start, because fat is the premium resource for nourishment and energy in a harsh environment like that of our planet 3,000 years ago…this line carries and omen of ‘good fortune in small affairs, bad fortune in great affairs’. With this final repetition of the phrase about the horses pulling against one another the lines end. The final image is of ‘weeping tears of blood in streams’, as Legge translates it. The line is not central and, though correct, it lacks a corresponding Yang line in the third place, and in fact that person is lost and rudderless. So here we have the image of the difficulties of the wedding party…but without the actual wedding. The bride abandoned at the altar, with no recourse and no one on whom to call for help. All she can do is cry. The image of blood flowing and tears flowing is unclear and various translators stress one side of it or the other, tears or blood. Although there is no evidence for there having been contact with the Ferghana valley in the Zhou period, during the Han the famous horses of Ferghana were known for ‘sweating blood’. This was caused by a skin parasite and would cause them to be covered in blood after a good run. However, the bleeding caused no lasting harm and the horses of Ferghana were known as ‘celestial horses’ and greatly prized by Han nobles. I include this just as an aside, since we have no way of knowing many of the origins of phrases in the Yi, a document from a different age.